MeLinda is a Wichita-based freelance writer who loves quoting lines from movies and television shows. She is a member of the Society of Travel Writers and the Midwest Travel Writers Association. You have out-of-state friends coming to Wichita with three young daughters who love animal experiences so where do you take them? Sedgwick County Zoo or Tanganyika Wildlife Park? I decided both! Here are my notes on how to enjoy animal experiences in Wichita. The girls ages 5, 8 and 12 and their parents loved both Wichita attractions even though we went in July during one of the hottest times of the summer. I visited them in Missouri recently and the oldest, Carrie, is still wearing the cap she bought in the gift shop, Rachel told me she wanted to come feed the lorikeets at Tanganyika again and the youngest, Sara, remembered walking through the zoo’s tropical rainforest. Their parents appreciated exposing the girls to a wide variety of animals and having memorable experiences at both. We got to the Sedgwick County Zoo soon after it opened at 8:30 a.m. on Sunday morning to take advantage of cooler morning temperatures and to beat some of the crowds. We used their stroller rental to push the two youngest around because this is a big zoo, the seventh largest zoo in the U.S.! We appreciated the many shaded areas throughout the zoo’s nearly 250 acres and the number of animals we saw: 3,000 individual animals of nearly 400 species call the Sedgwick County Zoo home. Despite its size, it is easy to navigate. I’m told that if you stay to the right when you enter, you can walk 4 miles and see everything. We didn’t follow that advice, though, and skipped around to see everyone’s favorites. We found the Mexican wolves, the river otters and bears in the North America section. We visited Africa to see the giraffe, lions and the Reed Family Elephants of the Zambezi River Valley, a 5-acre exhibit that I’ve been bragging about since it opened in 2016 as the third largest elephant habitat in the country. We also explored the zoo’s other geographic areas and stopped at the Children’s Farms as well as going inside to see the Tropics and the Amphibians and Reptiles. Our visit lasted about three hours. Everyone enjoyed the fact that the exhibits are large and allow the animals to display natural behaviors, even though sometimes that meant they were hiding in places where we could barely see them (I’m talking about you, tigers!). If you’re planning to go to both attractions on the same weekend like we did, I recommend going to the Sedgwick County Zoo first. While there are a couple of interactive options at the zoo, Tanganyika is built around interactive stations and the younger kids in your group will ask when they get to ride the camel if they’ve experienced Tanganyika first! At the Sedgwick County Zoo, you can feed the giraffe during specific timeframes ($2 per person) and there are machines throughout the zoo where you can buy fish food for the ponds. Included in the zoo admission, you can also watch zookeepers feed the animals and ask questions during zookeeper chats. They also schedule animal encounters on specific days. If these activities are something you’re interested in, make sure to check the schedule online and also ask at the gate for that day’s schedule. The zoo also has a boat tour ($3 per person) and offers free tram rides with five designated tram stops. It wasn’t running the day we visited, though, because there was a special event in the afternoon. Tanganyika Wildlife Park uses the tagline “A Wildly Different Experience” and that pretty much sums up our experience. It’s smaller than the Sedgwick County Zoo and wouldn’t take long to simply walk through and see the 40 exhibits of animals. If you take advantage of the nine interactive stations, though, you’ll be there a little longer! First, you need to plan a little before you get to the admission gate. Look through the list of interactive stations and decide what your group will want to do while here. Also, be sure to ask at the gate what stations are open the day you are there and if any will be closing at specific times. Of course with any animal experience like this, it’s up to the animals whether they want to participate or not! However, we waited until the end of our visit to go ride the camels and were then told they close that station earlier than the others. Just look through the list and be sure to ask about any that you know you want to participate in. What you want to do will determine which ticket you purchase. You can buy a general admission that allows you one animal encounter or you can buy passes that include either five or 10 animal encounters. Our group did the 10-encounter pass and each person used their 10 by doing several stations more than once. The giraffe feeding was a big hit with the 5-year-old, and they got a great family photo of one of the giraffe bending over for lettuce above their heads. If you don’t have someone there to take a photo for you, ask the Tanganyika staff, they are very friendly and willing to help. You can’t take a photo on the island with the ring-tail lemur feeding station, but staff there will take one for you while the lemurs pose! You can print it off at a station on your way out of the park (included in the price if you purchase one of the passes). Another tip: even if you’re not feeding the lemurs, you can go out to the island and talk to the staff about them. The whole family enjoyed the lorikeet feeding station, although some were more enthusiast about the birds landing on their heads than others! This was one that we came back to and repeated a few times. The girls loved holding the small cups of nectar and waiting for a bird or two or three to perch on their arm and drink. Near the lemurs, we also fed bunnies, guinea pigs and tortoises. Other stations that weren’t open during our visit: pygmy hippo and Indian rhino feeding stations and the camel ride. Next time you have friend or family visiting who want animal encounters, make sure to take them to the Sedgwick County Zoo or Tanganyika Wildlife Park … or both! They’ll love both for different reasons! 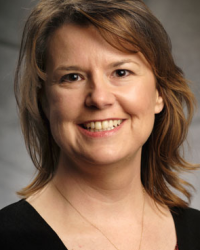 MeLinda Schnyder is a Wichita-based freelance writer who travels often and writes travel features for local and national publications. 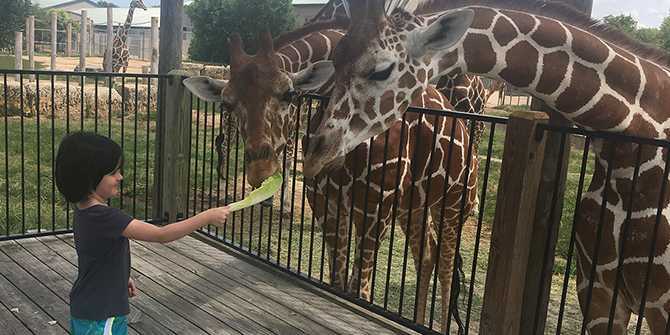 She frequently includes zoos and aquariums on her itinerary, and she thinks Wichita’s animal encounters stack up with the best in the country.